The Destination step of the wizard is available if you have chosen to change a location and settings of the recovered VM. In the Host field, specify a host on which the VM must run. Veeam Backup & Replication will create a clone/virtual copy of the storage snapshot, mount it to the selected ESX(i) host and start the VM on this ESX(i) host. In the VM folder field, select a folder to which you want to place the recovered VM. In the Restored VM name field, enter a name under which the recovered VM must be registered. By default, Veeam Backup & Replication uses the original name of the VM. If you are restoring the VM to the same ESX(i) host or same datacenter where the original VM is registered, and the original VM still resides there, it is recommended that you change the VM name to avoid conflicts. 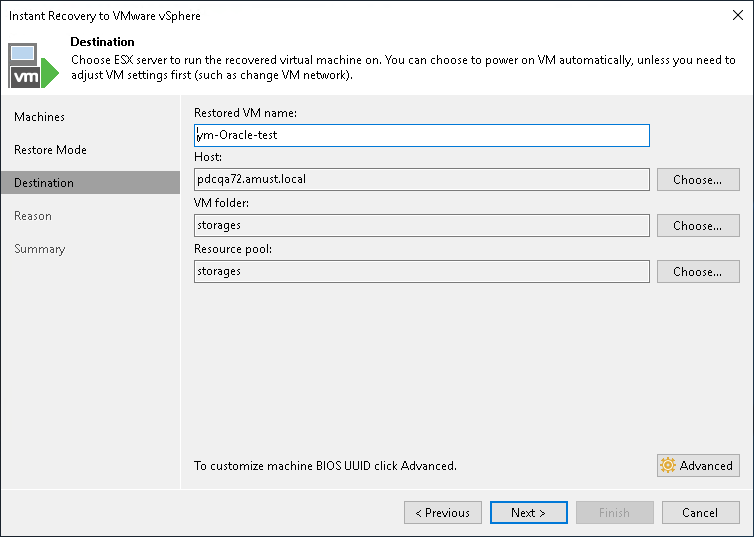 In the Resource pool list, select a resource pool to which you want to place the recovered VM.